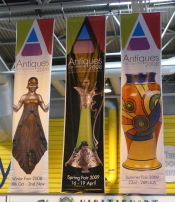 The end of July saw us visit the Antiques for Everyone Fair at the Birmingham NEC. Always an interesting fair to walk around, July's fair was even better than usual thanks to a large exhibition of Carlton Ware by Carlton Ware experts Dr Czes and Yvonne Kosniowski. The Kosniowskis are well-known amongst Carlton Ware collectors and are the people behind the very useful CarltonWare.com website. Founded in 1890, Carlton Ware was a brand name devised by the Wiltshaw & Robinson pottery for its ceramic wares. Although its output spanned nearly 100 years, the decorative wares the company produced between WWI and WWII are most sought-after by today's collectors. Often lustre-glazed and usually intricately decorated with coloured enamels and gilding, these high quality oriental and Art Deco-themed designs remain in strong demand today. Visitors to the Kosniowskis' exhibition were treated to the largest display I have ever seen of these pieces, housed in a total of eighteen glass display cabinets! Highlights of the exhibition included some excellent examples of early 20th century Chinoiserie patterns as well as slightly later 1930s Art Deco pieces in patterns such as Babylon. There was also a whole shelf of wares decorated with the Chinaland pattern - including what looked like the large ginger jar featured on the cover of the Kosniowskis' book 'A Pocket Guide to Carlton Ware'. This book, incidentally, is a comprehensive guide to Carlton Ware pattern and shape numbers and is indispensable for anyone interested in buying or collecting Carlton Ware. Other highlights of the fair for us included the AD Antiques stand, which had their trademark wide range of high quality British art pottery. Royal Lancastrian, Wedgwood Fairyland lustre (by Daisy Makeig-Jones) and early Moorcroft were all well represented, and there was a sprinkling of other early 20th century art pottery, too. The Antiques for Everyone fair is a vetted fair - all stock must be of a certain age and is inspected before the fair begins. This means that the quality of goods for sale is always a cut above most other mainstream antique and collectors' fairs, making it an interesting place to spend a few hours, even if you aren't buying. Stock isn't just restricted to ceramics - everything from furniture to glass to jewellery is on offer, so why not make a date in your diary for the next fair, which runs from the 30th October - 2nd November?